Coworking is not only about the physical place, but about establishing a community. Indeed, its rapid growth has been seen as a possible way for city planners to address the decline of high street retail in urban centres. Its benefits can already be experienced outside of the physical spaces, and it is recommended to start with building a coworking community first before considering opening a Coworking place. However, some coworking places don't build a community; they just get a part of an existing one by combining their opening with an event which attracts their target group. Real-estate centric coworking spaces are about selling desks first, with building community as a secondary goal. Players target freelance professionals, remote workers, and small to medium enterprises (SMEs) who need a space and seek a community with a collaborative spirit. Customers also often benefit from professional services such as printing or incorporation or consulting. Coworking is distinct from business accelerators, incubators and executive suites. These spaces do not fit into the coworking model because they often miss the social, collaborative, and informal aspects of the process. In coworking, management practices are closer to that of a cooperative, including a focus on community rather than profit. Many[weasel words] of the coworking participants are also participants in an unconference like BarCamp and other related open-source participatory technology events. Between 2006 and 2015, a few studies have shown the number of coworking spaces and available seats have roughly doubled each year. Brad Neuberg is credited with starting the coworking movement in San Francisco in 2005 with the idea to combine the independence of freelancing with the structure and community of an office space. To do this, he invented the word "coworking" with no hyphen. Coworking as we experience it today was preceded by European hacker spaces of the 1990s, where programmers would exchange skills and best practices. Some coworking places were developed by nomadic Internet entrepreneurs seeking an alternative to working in coffee shops and cafes, or to isolation in independent or home offices. A 2007 survey showed many employees worry about feeling isolated and losing human interaction if they were to telecommute. Roughly a third of private-sector and public-sector workers also reported that they did not want to stay at home during work. Another major factor that drives demand for coworking is the growing role of independent workers. Toong's design in Hanoi is a blend of cultural features and modern details. Coworking in Asia has become very popular as space is limited in countries like China, India, Singapore, Vietnam, Philippines, Hong Kong and Taiwan. In Pacific countries such as Australia and New Zealand, coworking has been made popular over the last 8 years as the prices of commercial spaces and bills rise, with coworking being up to 25% cheaper for most freelancers and businesses. In Hong Kong for example, dozens of coworking spaces have been set up to foster the rapidly growing startup community; according to Forbes it is among the leading tech locations in the world, along with Silicon Valley and New York City. Spread across almost all districts, coworking places can be found everywhere while the majority of places are situated on Hong Kong Island and there predominantly in the Central and Sheung Wan districts. The Malaysian state of Penang, long regarded as the Silicon Valley of the East, has also witnessed an increase in coworking spaces. Aside from privately-owned startups, the Penang state government has embarked on a drive to convert colonial-era buildings in the capital city of George Town into coworking spaces. As well as tech startups, coworking is becoming increasingly common amongst digital nomads in Asia. A 2011 survey found most coworkers are currently in their late twenties to late thirties, with an average age of 34 years. Two-thirds are men, one third are women. Four in five coworkers started their career with a university education. The majority of coworkers work in creative industries or new media. Slightly more than half of all coworkers are freelancers. Coworking spaces in India are also on the rise with Mumbai experiencing a huge surge in 2017[quantify]. There are 200-odd companies offering shared office spaces in India and a sizeable chunk of them still identify themselves as startup-focused spaces. However, more providers of co-working spaces—including The Office Pass, Spring House Coworking, Awfis Space Solutions, 91Springboard, CoworkZone, InstaOffice, WhyWorks and BHIVE Workspace as well as global companies like WeWork—are positioning themselves as enterprise-focused facilities. The Australian market has also continued to grow. Global players such as WeWork and Spaces have entered the market, challenging locally owned and operated companies such as Hub Australia and One Roof. 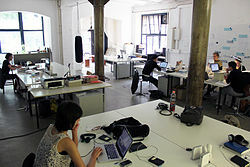 With many independent operators opening smaller specialist sites (including in rural and regional areas of the large country like Castlemaine, Victoria), some larger providers have expanded nationwide, with the distance between major cities an asset to both the coworking provider and the community. France opened its first coworking space in 2007, la Boate, located in Marseilles. In 2008, two new ones open in Paris: la Cantine and la Ruche. Nowadays, the U.K. is among[weasel words] the most responsive European country to the idea of collaborative working, with a special focus on London. The city leads the coworking market, not only for the large number of coworking places it offers but also for the variety of places that exist to fit the differing needs among start-ups, entrepreneurs and freelancers. Camden Collective is a regeneration project in London that re-purposes previously vacant and underused properties that opened its first ‘wire-less, wall-less’ coworking space in 2009. In June 2013, the U.K. Government announced it would be applying coworking principles to a new pilot scheme for its 'One Public Sector Estate' strategy covering 12 local authorities in England, which will encourage councils to work with central government departments and other bodies so that staff share buildings. This will enable the authorities to encourage collaboration as well as re-use or release property and land deemed surplus to requirements, cutting spending and freeing up land for local development. Coworking is also becoming more common in continental Europe, with the startup metropolis Berlin being a major booster for this development. Several diverse offers can be found in the city, such as Factory Berlin. This kind of working environment is not exclusive to big cities. Smaller urban areas with many young and creative people and especially university cities may offer coworking places, with Cowork Greifswald in Germany being one example. Cooperation between coworking spaces and academic environments are focused. Since Neuberg started the coworking movement in 2005, San Francisco continues to have a large presence in the coworking community and is home to a growing number of coworking spaces. Also in the Bay Area, Anca Mosoiu established Tech Liminal in 2009, a coworking place in Oakland. In Miami new places have been opening their doors. Coworking has also spread into many other metropolitan areas, with cities such as Seattle, Washington, Portland, Oregon, Toronto, and Wichita, Kansas now offering several coworking venues. The New York coworking community has also been evolving rapidly in places like Regus and Rockefeller Group Business Center. Several new startups like WeWork have been expanding all over the city. The demand for coworking in Brooklyn neighborhoods is high due to the rise in the millenial workforce; nearly one in 10 workers in the Gowanus area work from home. The industrial area of Gowanus is seeing a surge in new startups that are redesigning old buildings into new coworking spaces. In Brooklyn, in 2008, the first green-focused coworking space in the US, called Green Spaces, was founded by Jennie Nevin, and it expanded in 2009 to Manhattan and Denver and has been a driving force for green entrepreneurship through the collaboration of coworking. New models of coworking that go beyond the original concept of shared office space have also been established. For example, Work and Play in South Orange has onsite childcare for entrepreneurial parents and CoWorking With Wisdom in Berkeley combines coworking with yoga, meditation and mindfulness programs. ^ "Space Catalyst: Getting Started". Coworking wiki. ^ Foertsch, Carsten (2010-09-01). "7 tips for a successful co-working space". Deskmag. ^ "The Future of Coworking: coworking visas, corporate partnerships and real-estate specialists". Martin Pasquier. Innovation Is Everywhere. Retrieved 2015-02-14. ^ DeGuzman, Genevieve Five Big Myths About Coworking. Deskmag. 1 November 2011. ^ Fost, Dan. "They're Working on Their Own, Just Side by Side". The New York Times. The New York Times. Retrieved 5 July 2017. ^ Laura, Bliss. "How WeWork Has Perfectly Captured the Millennial Id". The Atlantic. The Atlantic. Retrieved 7 April 2018. ^ Cowan, Katy (2010-04-22). "10 of the best co-working spaces in the UK". Creative Boom. Archived from the original on 24 April 2010. ^ "10 Tips on Etiquette in the Co-Working Office". Free Office Finder. Jul 10, 2017. ^ Broadbent, Andrew. "Why Big Corporations Are Moving Into Coworking Spaces". Entrepreneur. Entrepreneur. Retrieved 7 April 2018. ^ "Coworking trumps traditional leases with possible savings of up to 25%". Hub Australia. 2017-11-13. Retrieved 2019-02-07. ^ Lianne Chia (26 January 2017). "A Silicon Valley of the East: Penang's thriving start-up community". Channel NewsAsia. Retrieved 27 May 2017. ^ "Is Penang Ready for the Coworking Movement?". Is Penang Ready for the Coworking Movement?. Retrieved 2018-06-07. ^ "'Repopulating' George Town via co-working, co-living spaces". The Edge. 18 April 2018. Retrieved 7 June 2018. ^ Lim, Jason. "The 11 Best Coworking Spaces In Asia". Forbes. Retrieved 2017-03-10. ^ "Co-working spaces to grow 50% in 2017, says JLL India chief" (Jul 20, 2017). Business Standard. Business Standard. Jul 20, 2017. Retrieved 18 December 2017. ^ Mehta, Dhaval. "Top 5 Coworking Spaces in Mumbai". The Luminary. The Croissant. Retrieved 18 December 2017. ^ "How freelancers, corporates, startups can benefit from shared workspaces". ^ Mahlberg, Tim. "Australian coworking spaces cater to a more diverse crowd than just young tech entrepreneurs". The Conversation. Retrieved 2019-02-07. ^ "Number of Coworking Spaces - 2017" (PDF). ^ "London’s Camden reinvents itself as hub for emerging businesses", Financial Times (paywall). ^ Abate, Tom (2010-06-04). "Shared work spaces new resource for solo worker". San Francisco Chronicle. ^ Woodall, Angela (October 15, 2012). "Hometown Hero: Anca Mosoiu, founder of Oakland's Tech Liminal". The Oakland Tribune. Retrieved October 16, 2012. ^ Chavez, Jesus (November 9, 2010). "Coworking - You Could Work from Home but Don't Want To". The Seattle Times. ^ McEwan, Bob (April 11, 2009). "Co-working: a room not of their own". The Oregonian. ^ Dullroy, Joel (May 9, 2012). "Coworking in Portland". Deskmag. ^ Carrie, Rengers (Nov 10, 2010). "Labor Party to open in Old Town for collaborative creative office space". The Wichita Eagle. ^ Zimmer, Amy (2 June 2015). "MAP: See the Most Popular Neighborhoods for Working From Home". DNA Info. Archived from the original on 11 June 2015. Retrieved 9 June 2015. ^ Albrecht, Leslie (12 June 2015). "Co-Working Spaces Booming in Gowanus as More Workers Shun Offices". DNA Info. Archived from the original on 22 June 2015. Retrieved 20 June 2015. ^ "GREEN ACRE". New York Post. 2009-04-13. Retrieved 2017-09-22. ^ "Co-Working Spaces Add a Perk for Parents: Child Care". Retrieved 2018-09-06. ^ "CoWorking With Wisdom opens in Downtown Berkeley". The Daily Californian. 2018-07-19. Retrieved 2018-09-06. DeGuzman, Genevieve V.; Tang, Andrew I. (August 2011). Working in the UnOffice: A Guide to Coworking for Indie Workers, Small Businesses, and Nonprofits. Night Owls Press. ISBN 978-1-937-64501-4. Jones, Drew; Sundsted, Todd; Bacigalupo, Tony (2009-10-27). I'm Outta Here: how co-working is making the office obsolete. NotanMBA Press. ISBN 978-0982306703. Schuermann, Mathias (2014-02-19). Coworking Space: A Potent Business Model for Plug 'n Play and Indie Workers. epubli GmbH. Wikimedia Commons has media related to Coworking space. This page was last edited on 20 April 2019, at 07:51 (UTC).